Hey Sylvie I love this black and white, my favs:)It's stunning thanks for sharing and hope your having a great weekend.. This is just beautiful Sylvie! Are you going to Ally Pally this time? Superb, elegant CAS card Sylvie, love it! Sylvie,I think you have made a wonderful CAS card. Know what you are saying though as I struggle with them. 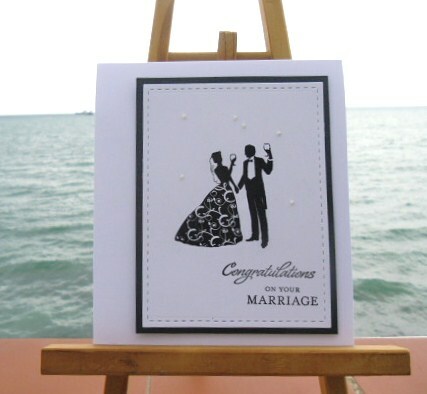 Beautiful black and white card. Hi Sylvie, don't know why you say you find CAS cards difficult as you are so good at making them! This is another stunning make! Stunning and elegant Sylvie, love it! hi sylvie... really lovely card! doesn't look to me that you have trouble with clean & simple!! Stylish, elegant - simply classic! Beautiful Sylvie, love that stamp. This is just so elegant Sylvie!